Make and Take at Marcos! I am thrilled to announce that I am coming to Marco's Paper in Centerville OH this Friday (tomorrow)! The card above is the Make & Take Card we will be making while I am there. 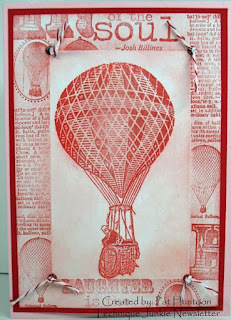 The card uses two techniques from the Newsletter: Gelato Direct, from the October 2011 issue of the Technique Junkie Newsletter, and Embossed Gelatos, one of the upcoming techniques from the April 2013 issue. This sentiment on this card is from Verses Rubber Stamps, and the background and dragonfly are both from Impression Obsession. 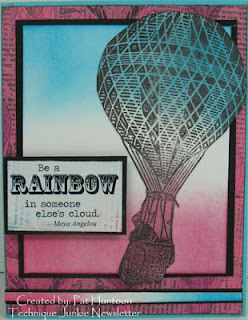 I am so thrilled to be part of the first Club Scrap Blog Hop today! If you started at the Club Scrap blog, you are in the right place. If not, I urge you to take a moment to visit the Club Scrap blog -- not only to find out more about this hop, but to leave a comment for a great giveaway! Today we are celebrating Club Scrap's February Kit: Up, Up and Away. If you have never experienced Club Scrap or Club Stamp, you are missing out on gorgeous paper, stamps and embellishments at a terrific value. This kit is no exception! I received my first kit in June 2002 and have been enamored ever since. 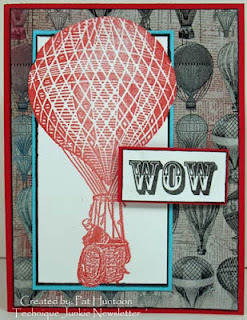 For today, I made three cards from the stamps and paper from the Up, Up and Away kit. I used the same focal image for all three cards -- I was going for a little bit of "the same-but-different" idea. 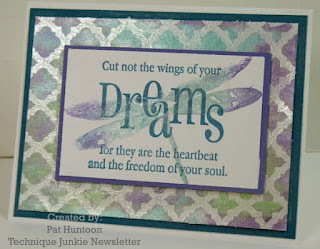 I could have made many more cards from the kits, too -- all very different -- but I ran out of time! All three of the cards use techniques from the newest Technique Junkie Newsletter CD: Simple and Easy Inking Techniques - Remix CD. It contains 30 tutorials culled from previously-published Newsletter issues. All of the techniques use just the most basic of supplies. The CD is only $9.95; more information can be found HERE. The top card uses the Out of the Box Technique. Don't you just love that gorgeous background paper? 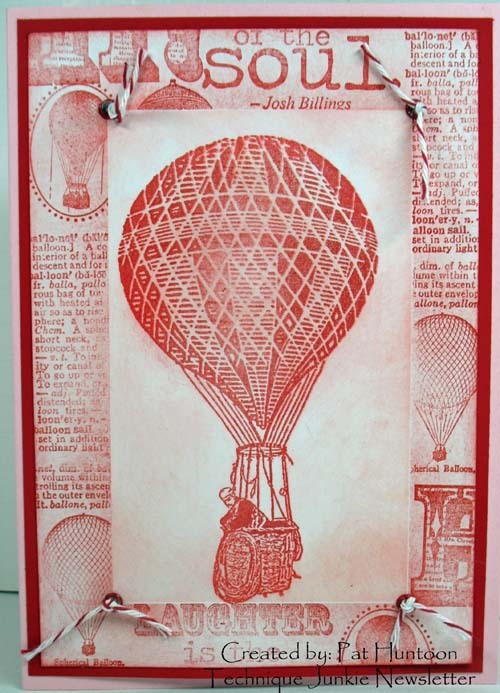 The middle card uses Color Sandwich Technique to get the two-toned effect from both the card and the popped balloon element. The bottom card shows the Block Collage Technique. A little masking goes a long way! Well, onward with the hop -- your next stop is Julie Heyer (http://capecodscrapper.blogspot.com/) you will love her project! Enjoy the hop, and thanks for stopping by today!